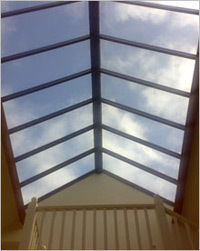 Pentagon Protection, specialists in making existing glass safe and secure; with advanced window films and anchoring systems, our product range includes bomb blast protection film, solar films, energy efficient films, safety films, security films, privacy films, tinted films and films that protect against fading. These products provide solutions for energy efficiency, glare reduction, glass security, safety glass, fading protection, wind protection, spontaneous glass failure and terrorism/bomb proofing. 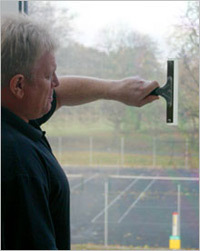 As a world-leader in the development and advancement of protective window films and glass containment anchoring systems, Pentagon Protection has been providing immediate and cost-effective retro-fit solutions to problems associated with architectural glass and glazing in commercial and residential buildings since 1996. Specialising in the supply and installation of anti-shatter/safety films, bomb blast protection, security and solar control films as well as opaque privacy films and manifestation graphics and with global operations working in over 65 countries worldwide, Pentagon's commitment to research and development and the advancement of both product and standards is second-to-none. Whilst developing new and buoyant international markets - as building owners and property managers seek to improve the performance of their properties and protect their assets and occupants - we have launched our tried and tested range of InfraMax energy efficient coatings for increased energy efficiency and reduced CO2 emissions and edge-retention anchoring profiles for advanced and effective glass containment. The first to design, develop and test glass containment film and framed anchoring with the Doortek Enhanced Security System as protection against forced entry burglary. The first to test glass containment film and flexible edge retention to ISO 16933 with the Pentagon FT800 glass containment film and Elite� flexible edge-retention anchoring profile. The first to test ISO 16933 Standard with the Pentagon Select rigid anchoring system as a retro-fit edge-retention profile. 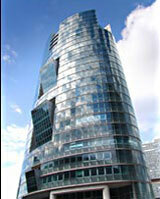 The first to introduce and test the very latest in energy efficient coatings for glazing. The Pentagon InfraMax LX70 Energy Efficient Coating for solar heat reduction and increased energy efficiency helps in the reduction of CO2 emissions in accordance with EU directives and government legislation. The first to test to and promote the Glass and Glazing Federation's Recommendations for Film applied to glass in the overhead position for containment of glass in the event of failure: Test Method 5.18.5. 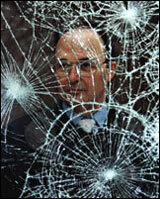 The issue - Terror attack - exposing people and business to the vulnerability of glass. With the threat of attack a very real and serious possibility in cities and society throughout the world today, protecting people and assets alongside business continuity and emergency planning are a matter of priority for us all. With 90% of all injuries in a blast caused by flying glass, the first area of priority must be the weakest link in our buildings - the glazing. We tend to forget that the clear glass protecting us from outside elements cannot provide protection from the dangers of a blast. It in fact becomes a danger in itself. Powerful shock waves from a high-velocity attack emanate in all directions. 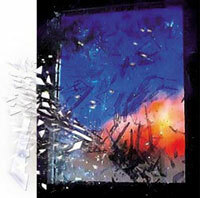 Your windows could convert into lethal flying shards of glass. Your building will then be open to the elements, allowing the bomb blast to enter your building at speed where internal glazing is also vulnerable, with fixed internal glazing or glass partitioning proving to be just as hazardous. Our greatest desire is to minimise the quantity and hazard of broken glass and blast induced debris, ensuring business continuity and stability. The solution - Protecting a building's occupants and business continuity is our priority. 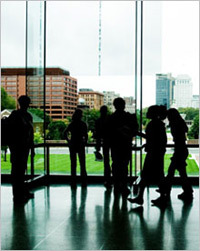 Protect your business, property, employees and members of the public with Pentagon Protection blast mitigation high-tensile strength anti-shatter film. Pentagon Protection Blast Mitigation Anti-Shatter Film, when applied to your existing glazing, whether to doors and windows or overhead and internal glazing, will mitigate the effects of bomb blasts on glass. It is an immediate and cost-effective retrofit solution, especially when compared with the replacement of existing glazing. The film, normally applied to one side of the glazing, will absorb a large degree of the shock wave, stretching, without tearing and lessening the effect as it enters the building. In many cases although the glass breaks, the filmed glass will fall out in one piece, attached to the pressure sensitive film. This minimises damage and injuries. Pentagon Protection's range of Anchoring Systems and upgrade profiles have become far more popular as a result of increased concerns over the need to retain broken glass intact within the glazing system with Pentagon Protection the first to test to the highest of blast mitigation standards ISO 16933. Pentagon Protection's clear glass containment film with or without anchoring and edge-retention provides an immediate and cost-effective retrofit solution to provide enhanced protection and security. The issue - Excessive use of air conditioning, due to solar energy, with resultant increased CO2 emissions. The use of electricity produces CO2 and with air-conditioned office space having tripled over the last decade and on the increase, saving energy in non-domestic buildings is, according to ACE (The Association for the Conservation of Energy) and The Carbon Trust, the sector where much greater savings are possible. High temperature in buildings is invariably caused by energy from the sun. 86% of total solar energy is admitted through clear glass. This coupled with ever increasing fuel costs and the introduction of a 'Climate Change Levy' on energy used calls for prompt action! If you want to help temper global warming by reducing carbon emissions then using a cost-effective glazing material that will also save your business money in the long term is a smart move. The solution - Solar heat control film and coatings. Pentagon Protection supply and install solar heat control window film and InfraMax Energy Efficient Coatings that reduce the transmittance of light and infrared heat through glass windows and doors. This reduces heat gain and provides many immediate benefits. With our sputtered films and coatings, the cooling loads demanded by air conditioned buildings can be substantially decreased. This gives business managers the possibility of significant savings in energy costs, including a reduced climate change levy liability, whilst maintaining workplace comfort. Selecting the correct product for the type of glazing is not always straightforward. Pentagon Protection, as specialists in solar control and heat reduction will of course provide assistance in product specification and recommendation. The latest Pentagon InfraMax Energy Efficient Coatings offer increased heat reduction and energy efficiency with maximum visible light transmission whilst retaining the aesthetics of your premises. It is ideal for heat gain reduction with historical or listed buildings. A combined safety/heat reduction version is also available. 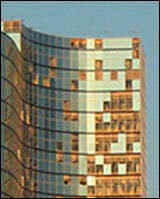 The issue - Glass - potentially the weakest link and quickest route into your building. The weakest part of a building structure is the glazing. It provides an immediate point of entry for break-ins or a focus for vandalism. Shattered glass causes disruption and distress and there are significant financial implications and loss of business during clear up. Standard glazing is not designed to resist vandalism or forced entry burglary, nor severe windstorms, hurricanes and tornadoes and their consequent wind-borne debris. These events expose people to both scattered and flying glass. Pentagon Protection can provide an immediate and cost-effective solution to the vulnerability of your glazing and the consequent loss of security. The application of glass containment film from the Pentagon Protection range will significantly reduce the vulnerability of glass without reducing the benefits of clear glazing. Tested to BS EN12600 Impact test, Pentagon's range of glass containment security film is designed to absorb and stretch under attack - bonding any broken glass to the film. When applied to existing glazing it forms a barrier that delays penetration of your glass making it difficult to gain easy and immediate access. With 'smash and grab' thefts accounting for a large percentage of commercial criminality, if the burglar is met with a degree of resistance due to the presence of Pentagon's glass containment security film, the individual will usually quickly give up and move on. The benefits of Pentagon's glass containment film can also be combined with solar-control, providing you with both safety AND solar protection. For enhanced security protection, take a look at our Pentagon Protection Anchoring Systems. Tested to the highest of ISO and GSA Standards, glass containment and anchoring has been proven to provide optimum levels of protection. Glass is very much taken for granted in our society today and the fact of exactly how vulnerable and lethal it can become is sometimes overlooked. Standard window glazing offers no protection whatsoever from injury and if broken, either by accident or intent, it can become extremely dangerous - suddenly turning our light and comfortable, safe and secure environment into a place of extreme danger! Is your glazing safe? Does it comply with glazing safety standards and regulations? If unsure, check here for more information. Regulation 14 of the Workplace (Health Safety and Welfare) Regulations 1992. BS EN12600 Glass in Building � Pendulum test � Impact test method and classification for flat glass. An immediate and cost-effective solution to upgrade existing glazing and provide peace of mind, is the retro-fit application of a high quality clear safety film from Pentagon Protection. Available in a choice of thicknesses to provide the safety or security level required. When professionally installed, Safety film forms an almost invisible protective coating on the glass surface bonded by its extremely aggressive pressure sensitive adhesive system resulting in any broken glass remaining adhered to the film. The application of Safety Film can be improved to provide an even higher degree of protection with the addition of one of Pentagon Protection's edge retention profiles as an enhanced anchoring system. Solar Security Film offers significant solar heat and UV control in addition to the standard protection benefits of Pentagon's clear Safety Film offering a 3-in-1 type of product for Safety protection, solar heat control and UV radiation and fade control.